More and more people have begun running as a way to stay in shape. It’s a physical and mental sport that’s riddled with devotion and zeal. The runner’s only teammates in this sport are his or her feet, which need to be cared for appropriately with the absolute best shoes. Many sports stores carry a large variety of running shoes for the novice to advanced runners but when they approach the racks of shoes, many novice runners are unsure what to look for. Here we will help each runner find the right running shoe. First, one must understand the materials of the shoe and what each component of a good running shoe should provide. 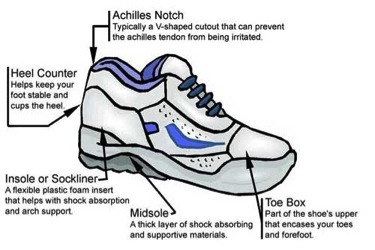 Toe Box: This is the front part of the shoe which should provide sufficient room to allow the foot to flex and to make the toeing-off part of the running motion easier. Heel Counter: This area strengthens the heel and increases stability. Generally, ones on the outside provide the most stability and motion control. Achilles Notch: Protecting the Achilles tendon, this furrow in the back of the heel collar, provides a secure fit that will prevent irritation to the tendon. The insole is the removable part that the runner’s foot rests on inside of the shoe. Its purpose is to provide more cushioning. The midsole will also provide additional cushioning and in certain shoes it will disperse pressure on the foot. The outsole is the bottom layer of the shoe that comes in contact with the ground. Next, a runner must be aware of their arch type and foot mechanics to find their best fit. 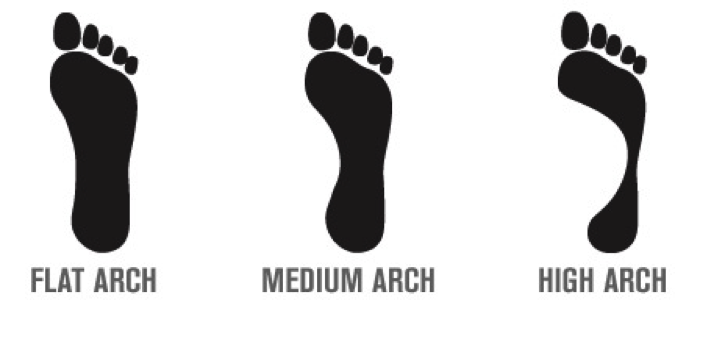 The best way to find your arch type is to do something called the “Wet Foot Test.” Simply dip your foot in water and walk on something that will show an imprint. Brown paper bags and cement are great. Compare your arch to the ones below to figure out what arch type your print resembles. 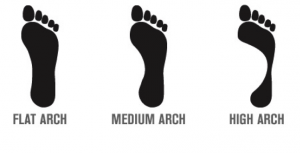 Now that you have identified what kind of arch you have, it’s time to tackle foot mechanics and figure out what type of shoe is best. Here runners should take into consideration the natural inward roll of their foot during running, called pronation. Once the heel hits the ground, the heel and ankle roll inward and the weight of the runner gets transferred to the middle of the foot. Injuries can occur from either overpronation or underpronation. Those with a high arch typically suffer from underpronation, where the runner will push off mainly from the small toes on the outside of their foot, and need a neutral shoe, one that will encourage a more natural foot motion inward. Medium arches with neutral pronation also would do well in a neutral shoe. Medium arches with mild overpronation, or pushing off from the inside, big toes, should focus on a stability running shoe that will reduce the degree of pronation. Finally, those with a flat arch have severe overpronation and require a motion control running shoe to combine stability and cushioning to prevent excessive overpronation. Hopefully this guide will help you identify the best running shoe for you. If you need more personalized help, most local sporting good stores have staff educated or passionate about running that will be able to aid you in your search for the right shoe. Happy running!